Introduced last year, the BMW 4 Series is a newer model line with a familiar concept: essentially, 2-door versions of the 3 Series. Available as a coupe, hardtop convertible or the new 4-door Gran Coupe, the 2015 4 Series sets itself apart from luxury rivals like the Mercedes-Benz C250 coupe and Audi A5 with its emphasis on handling and performance. If you crave the excellent handling and power of the 3 Series sedan in coupe or convertible form, look to the 2015 BMW 4 Series. The new 4-door Gran Coupe is the only 4 Series with room for five, and is able to carry cargo easier, thanks to its wide-opening liftgate. If a comfortable ride takes priority to sharp handling, the Mercedes-Benz C250 or Cadillac ATS coupes may better suit your taste. It should also come as no surprise that rear-seat space in the coupe and convertible is tight - which is where the 4-door Gran Coupe comes into play. This year marks the debut of the 2015 M4 coupe and convertible, and the new 4 Series Gran Coupe. The former models pack a roaring 425-horsepower engine and other performance upgrades, while the latter is a 4-door model with more cargo room and passenger space. The 4-passenger cabin of the 4 Series coupe and convertible is comfortable for those in front, but just adequate for rear passengers. BMW has long shaped its cabins around the driver, and that focus remains here. Controls are within easy reach, and the iDrive control system is getting simpler. If your front-seat passenger plans to apply makeup, she should bring her own mirror - those in BMWs are surprisingly small. Though the Gran Coupe's exterior footprint is the same as 2-door models, this 4-door has better rear-passenger access and over 45 cubic feet of cargo space with rear seats folded. BMW didn't reinvent the wheel for the 4 Series' external design vs. the previous 3 Series coupe, but that's hardly an insult. Compared to its sedan sibling, the coupe and convertible are slightly larger and lower, with headlights that flow into the "twin-kidney" grille. The new 4 Series Gran Coupe takes its cues from the larger 6 Series Gran Coupe, adding two rear doors while retaining a swooping roof. Instead of a trunk door, it has a power tailgate that opens high for easy loading. M4 performance models look meaner with larger front air intakes, power-dome hood and quad exhaust outlets. 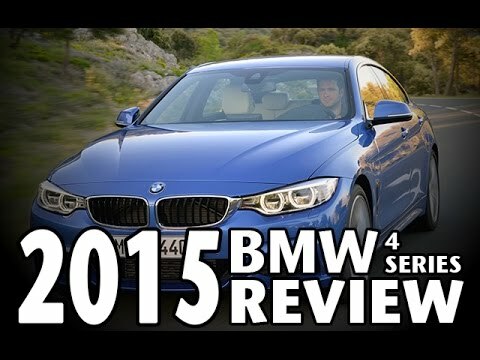 The 2015 4 Series takes the performance traits of the BMW 3 Series - agility, acceleration and overall balance - and goes one better. With a wider stance and lower center of gravity, 2-door versions of the 4 Series are the perfect partner if you enjoy throwing your car into a corner. Tradeoffs are noticeable road noise and a stiff ride on rough pavement. The roomier Gran Coupe excels at grand touring thanks to its lively yet smooth road manners and extra cargo capacity. 428i models employ BMW's excellent 240-horsepower 4-cylinder engine to power the rear or all four wheels. Though it's turbocharged, not a hint of lag is felt, even in "comfort" mode. 435i models use a 300-horsepower 6-cylinder that can propel all-wheel-drive models to 60 mph in 4.7 seconds. Transmission choices - an 8-speed automatic or 6-speed manual in 428i and 435i coupes - are exceptional. Packing 425 horsepower, the BMW M4 performance coupe and convertible can hit 60 mph in about four seconds. 2015 BMW 428i coupe and Gran Coupe models start in the low-$40,000 range, while convertibles begin around $50,000. Be aware these figures can quickly escalate with a few options (most paint colors, for example, add an extra $550). The new 2015 M4 Coupe opens around $65,000, while an M4 hardtop convertible is over $73,000. Load up these M editions, and you could be looking at $80,000-plus. The 2015 BMW 4 Series starts slightly higher than the Audi A5 and Mercedes-Benz C250 coupes, but its base engine has more horsepower. The Infiniti Q60 (formerly G37) coupe, meanwhile, has nearly the same base price as a 4 Series and comes with a 330-horsepower V6. Before buying, check the KBB.com Fair Purchase Price to see what others in your area are paying for their 4 Series. In the long-run, the 4 Series' resale value is expected to be average, lagging that of its Audi and Infiniti competitors. Step into a "base" 2015 428i and you'll get an excellent-driving vehicle with power front seats, your choice of an 8-speed automatic or 6-speed manual transmission (coupe models only), xenon adaptive headlights, a moonroof, dynamic cruise control, and automatic climate control. Standard audio is a 9-speaker system with HD Radio and a USB audio input. Higher-end 435i models feature a more powerful 6-cylinder engine and 18-inch wheels. In addition to a more powerful engine, the new BMW M4 coupe and convertible come with performance-oriented brakes and differential. The Gran Coupe adds a handy power-operated tailgate. From blind-spot monitoring to a 16-speaker/600-watt harman/kardon sound system, there are myriad ways to upgrade your 2015 4 Series. Among the more prominent offerings are the Premium Package that features hands-free trunk opening (you use a foot gesture) and replaces the faux leather upholstery with the real thing, and the Technology Package with navigation and dedicated apps. Three 4 Series "lines" - Luxury, Sport and M Sport - add their own interior/exterior aesthetics and comfort and performance upgrades. M4 models can further their performance potential with carbon-ceramic brakes and driver-selectable Adaptive M Suspension. The base engine in the 4 Series is so good that it leaves little reason to pay thousands more for the 6-cylinder variant. Beyond its impressive specs - 240 horsepower, 255 lb-ft of torque, up to 35 mpg on the highway - is its immediate responsiveness. As with other BMWs, the 2015 4 Series includes four years/50,000 miles of free factory-scheduled maintenance. That means oil changes, brake pad and disc replacement, drive-belt maintenance and more are covered. BMW tallies the savings at up to $2,000. We laud it for the peace of mind. The 2015 BMW 4 Series is available in three potencies. 428i models use a 240-horsepower 4-cylinder, 435i variants host a 300-horsepower 6-cylinder, and the new M4 coupe and cabriolet feature a 6-cylinder that churns out 425 horsepower. Rear-wheel drive (RWD) is the standard layout, and all models except the M versions can be had with all-wheel drive (AWD) for better traction. Most 4 Series models come with a smooth-shifting 8-speed automatic transmission. A 6-speed manual transmission is available in 428i and 435i coupes, as well as the M4 coupe and convertible. 428i and 435i models have start/stop technology that shuts off the engine at idle to save gas. Restarts tend to be jarring, however, and thankfully the feature can be disabled. Note that these premium engines require premium gasoline. Introduced last year, the BMW 4 Series is a newer model line with a familiar concept: essentially, 2-door versions of the 3 Series. The fresh nomenclature sets the 4 Series coupe and hardtop convertible apart from the growing variety of 3 Series models, though for 2015, the 4 Series itself is expanding with the introduction of the Gran Coupe, a 4-door meant to look sleeker than a traditional sedan. While the 2015 4 Series range is growing, the lineup retains the powerful engine choices, excellent driving manners, innovative technology and sporty styling inherent to BMW. Like luxury rivals such as the Audi A5, Mercedes-Benz C-Class coupe and Cadillac ATS coupe, the 4 Series adeptly blends performance and refinement to go with its $40,000-plus starting price. BMW 5-series ery good and recommend brand. While some of its rivals have worked hard to catch up to BMW’s 5-series in performance and handling, BMW seems to have switched gears and taken a more luxury-oriented approach with its mid-size sedan. What was once a driver’s delight is now more of a boulevard cruiser—one with a posh interior, plenty of people and cargo space, and a range of efficient and strong-performing engines. When the m550i performance model was introduced for 2018, we were hopeful that the ultimate driving machine was returning to the BMW showroom, but it too suffers from a mixed bag of dynamic traits. BMW 4 series convertible hardtop. I haven't had any problems with my car. I went from a 3 row SUV (Hyundai Santa Fe) to this small convertible. Drive is smooth and sporty. Back seat is small but I can fit comfortably (I am 5'2"). Gas mileage is a huge improvement. The hard top makes it seem like you have 2 different cars (sedan and convertible). It is very quiet when the top is up. I would recommend the 4 series convertible for anyone that is smaller and looking for a fun car. Great ride and stylish looks and feel. Very reliable and great to drive. Very responsive and holds the road well. Ok on gas. It looks very sharp and gets lots of compliments. Interior is very nice and I like the leather color. The stereo is good and I like how I can switch to play my own radio station from online as I am tired of radio that just plays the same songs. Solid doors.